One of the most pop ular video computer systems, Atari offers a fine selection of Game Program cartridges to provide an impressive variety of action plays no matter what your interest. Like all the other major game systems, once you own the Atari Video Computer System, you can acquire whatever program carts strike your interest. Prices for the carts vary with the particular program provided and with the newness and popularity of the game. As we go to press, the Pac-Man cart from Atari is selling like hotcakes in New York City, with discount electronic houses selling the $39.95 list cart for as low as $23.95 plus tax. After acquiring the basic Atari Video Computer System, game fans may purchase any of the numerous program carts that strike their fancy; pictured, some of Atari’s justly-famous space games; Asteroids, Missile Command, and the inevitable Space Invaders. Asteroids (CX2649) which puts you in control of a spaceship dealing with the hazards of deep space including alien ships and deadly asteroids. The cart gives 66 variations of the basic game. 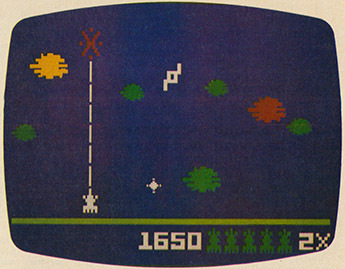 Missile Command (CX2638) is another space game, this one like Space Invaders (CX2632), both of which allow you to protect the home planet from the deadly forces of the unknown. 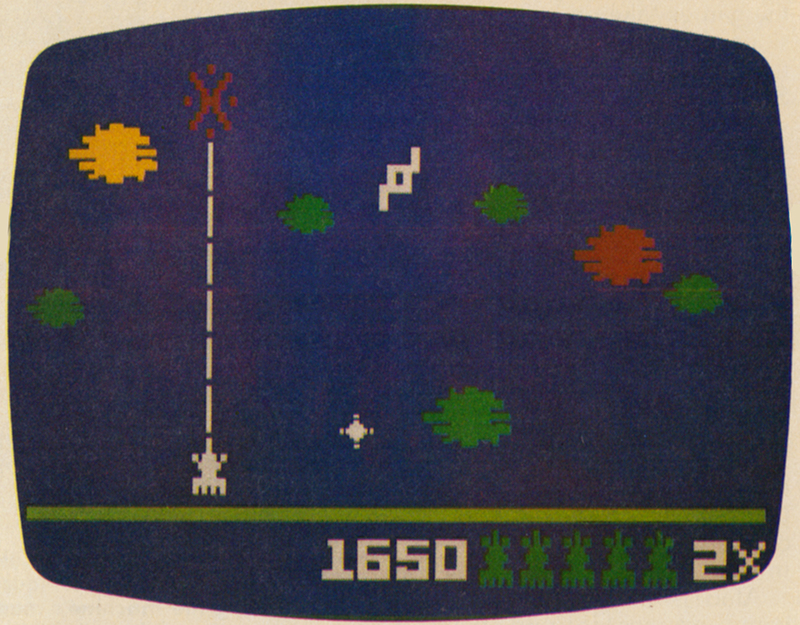 Another Atari space game is Space War (CX2604) which puts you in command of a starship. Coming up in the space war game category from Atari are Yars’ Revenge (CX2655) which should be in the stores by the time you read this. Yars’ Revenge is an exciting new game taking place in another solar system where Yars (which Atari describes as ‘mutant house flies’) are battling the enemy, known as the Qotile. The Yars have every chance to win, as you control the Yars scout as it eats through the protective shield that the Qotile has put up and the laser cannon that allows you to blast the Qotile. The popular arcade game from Williams, Defender, will also soon be available from Atari (CX2609). Defender gives you attack rockets with which to keep the aliens from turning the citizens of the planet into dangerous mutants. When it comes to eye/hand skill games, Atari has a good number of them available on cart. Among the most exciting are Super Breakout (CX2608) where you blast your way out of impossible situations in your starship; Human Cannonball (CX2627) where you calculate exactly how to shoot the man out of the cannon so he winds up in the water tower; Sky Diver (CX2629) in which you can score big points if you can parachute into the bullseye—that’s if you can get your chute open! ; and the hot new addition to the Atari line, Pac-Man (CX2646) which allows you go gobble along with Pac any hour of the day or night. What Atari describes as their ‘Classics’ are an impressive selection of the best of traditional brain games, all on convenient carts. You can pick games like Backgammon (CX2617); Video Chess (CX2645); Video Checkers (CX2636) or 3-D Tic-Tac-Toe (CX2618); or you can go for sophisticated Atari creations on cart like their version of the popular Othello (CX2639). Atari has carts in lots of other categories. There are action games like Haunted House (CX2654) where you try to avoid the hazards and horrors of the haunted house in the dead of night and Adventure (CX2613) where you try to outwit the evil magician. There are plenty of sports-oriented games, like Indy 500 (CX2611), Street Racer (CX2612), and Night Driver (CX2633) put you on the track at the speed of your choice; Homerun (CX2623), Pele’s Soccer (CX2616) and Football (CX2625) for plenty of indoor sports action; and Atari’s Video Olympics (CX2621) where you’ll find fifty games, among them the latest development of the original Pong. Video soldiers of fortune won’t be disappointed with Atari’s combat games. Among them are the classic Combat (CX2601), Outlaw (CX2605) for cowboys) Canyon Bomber (CX2607) for flyboys; Air-Sea Battle (CX2602) for those of you who want to sink a few ships; and Warlords (CX2610) for sword and sorcery fans. In a way, the most exciting Atari carts are some of those that aren’t necessarily designed as action games. 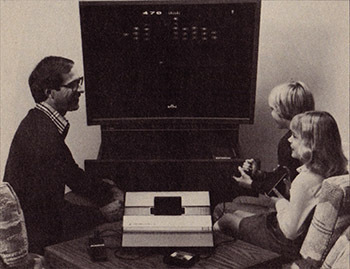 The Atari home video game system is a computer, after all, and so the company has created a number of programs that reflect its brainier talents. There is even one cart, Brain Games (CX2664), that generates nineteen games that will stump you if you don’t think out each move you make. Basic Programming (CX2620) lets you, as Atari says, “talk to the computer.” That’s right, even without a keyboard, you can learn some basic programming moves using this cart. Among the effects generated are actually printing out messages on the TV screen. 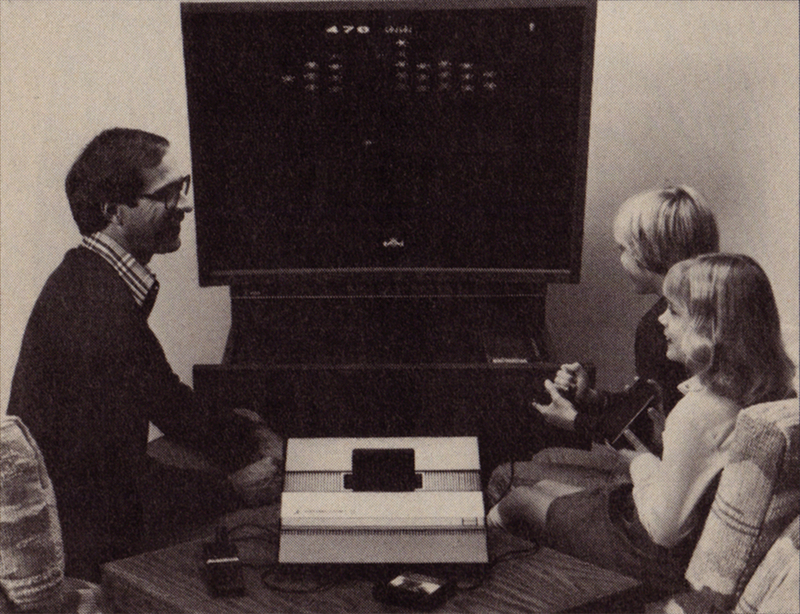 Now, did you know your Atari could do that? Top Secret: System X is on the way and will probably be in the stores by the end of the year. System X? 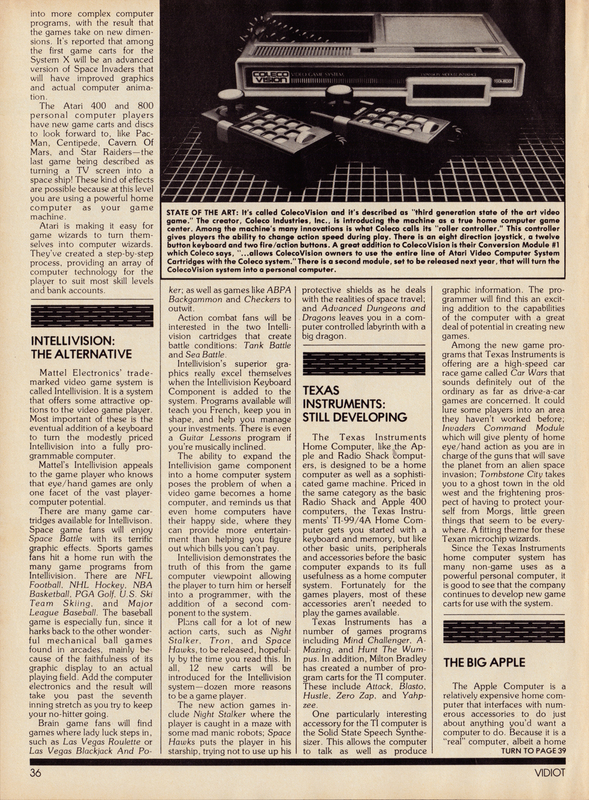 That’s right, X—scattered newspaper reports indicate that Atari has a new game computer system nearing production that they’re calling “System X.” The new system will be setting some new standards for home game computers if the reports are accurate. Of course the new Atari will have improved picture qualities. The graphics will be more detailed and the image will be sharper. But that’s to be expected with the present advances in the state of the art. Here is Atari’s new System X game computer, featuring more detailed graphics, a sharper image, and best of all the innovative Universal Controller, a handheld calculator-like unit which will allow the player to give detailed instructions to the game. What’s exciting about the new of System X is that Atari has been busy developing additional variables to make the games more exciting. The most incredible is the Universal Controller which will offer considerable advantages over the current joystick controller. The Universal Controller will be a hand-held unit somewhat like a pocket calculator, and will allow the player to give extremely accurate and detailed instructions to the game on the screen. With the new controller, the old four-direction game piece movement will be increased to eight directions, and the player will be able to regulate the speed as well as the direction of the piece. With this new controller, plus the possibility of speech synthesized sounds as well as generally improved audio, and a hotter, more detailed picture, System X may well be the home game computer that begins to make arcade players turn their heads in the direction of home play, for it is no doubt that System X will bring home game play closer to the current level of arcade play. Atari has created a thoroughly enjoyable home game computer with their present system. They have kept up to date with the latest in arcade favorites and created some fascinating programs of their own. With news of the System X, they are taking another step towards the goal of making their game computer the best computer possible for the cost involved. With the new system, Atari will continue to keep a rapid pace in the release of game cartridges. Plans reported underway include the release of many new and classic space games, arcade favorites, and sports games for the system. Now that home video is firmly established (with thanks to Atari), the time has come for it to get even better; there’s no question that System X will do that for it. Space pirates can get bigger and bigger computers to play more spectacular games if Atari has anything to say about it. Atari offers their Video Computer System with 45 Game Program cartridges at one of the lowest prices for a home game computer. As noted elsewhere they will now produce a higher priced home game computer with advanced controls as the Atari Video System X. The step after that is the Atari 400 home computer, followed by the Atari 800. Ready ! Note the escape tunnels are on the left and right of the board maze in the System X while they’re on the top and bottom of the Old Atari system. 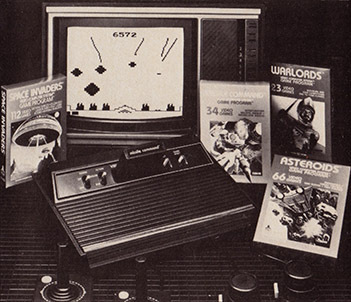 Players who have Atari’s basic Video Computer System are already assured of a full catalog of catalog programming, with more carts on the way in the future. 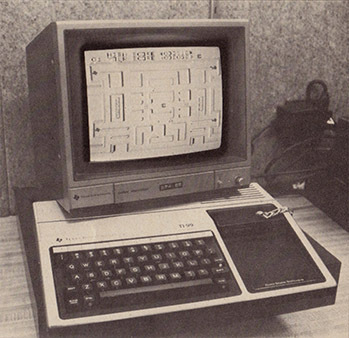 Those players who get the Atari Video System X will have a computer with better microprocessor chips able to perform functions (like human voice synthesis) that aren’t available with the VCS basic system. 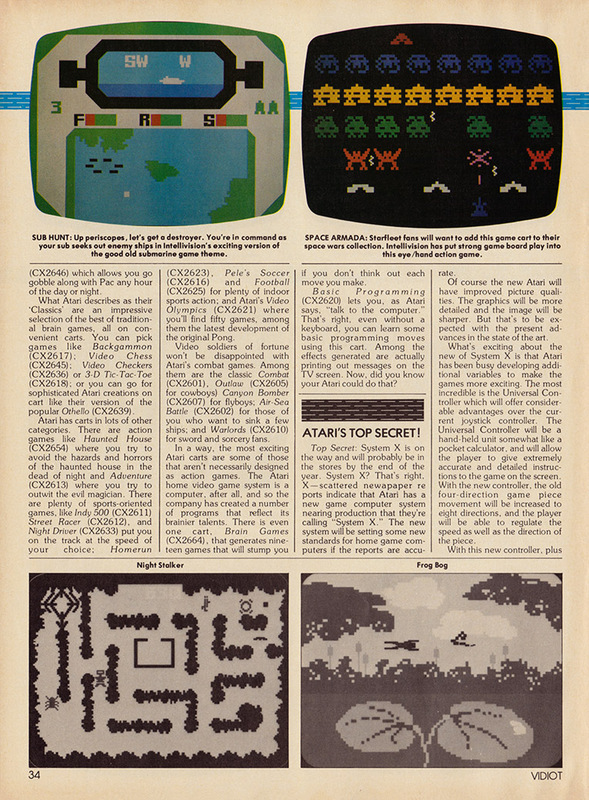 This means Atari can update some of their most popular games into more complex computer programs, with the result that the games take on new dimensions. It’s reported that among the first game carts for the System X will be an advanced version of Space Invaders that will have improved graphics and actual computer animation. The Atari 400 and 800 personal computer players have new game carts and discs to look forward to, like Pac-Man, Centipede, Cavern Of Mars, and Star Raiders—the last game being described as turning a TV screen into a space ship! These kind of effects are possible because at this level you are using a powerful home computer as your game machine. Atari is making it easy for game wizards to turn themselves into computer wizards. They’ve created a step-by-step process, providing an array of computer technology for the player to suit most skill levels and bank accounts. 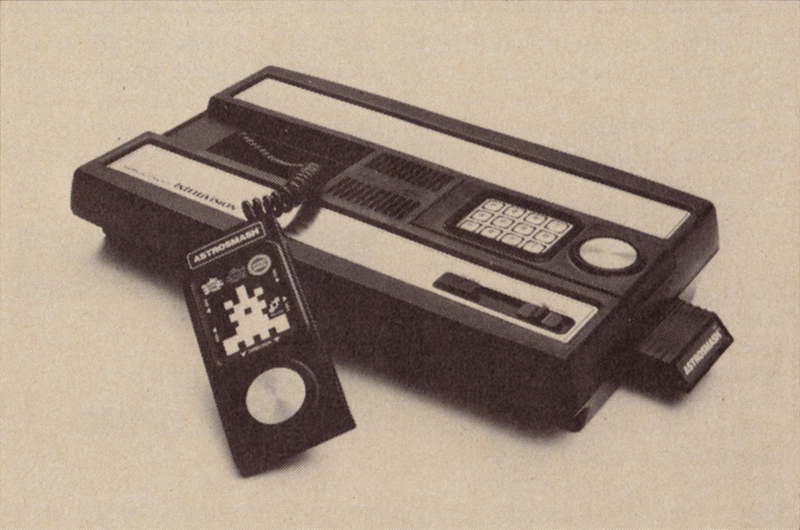 Mattel Electronics’ trademarked video game system is called Intellivision. It is a system that offers some attractive options to the video game player. 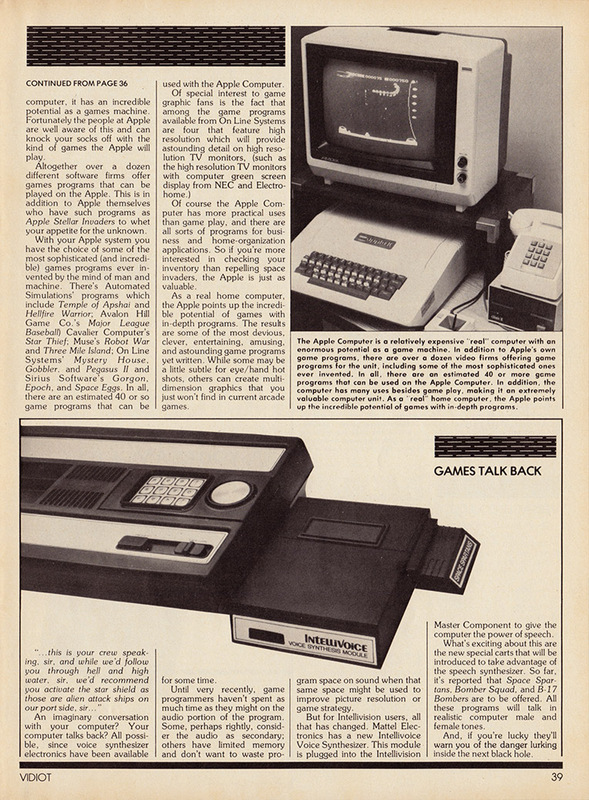 Most important of these is the eventual addition of a keyboard to turn the modestly priced Intellivision into a fully programmable computer. 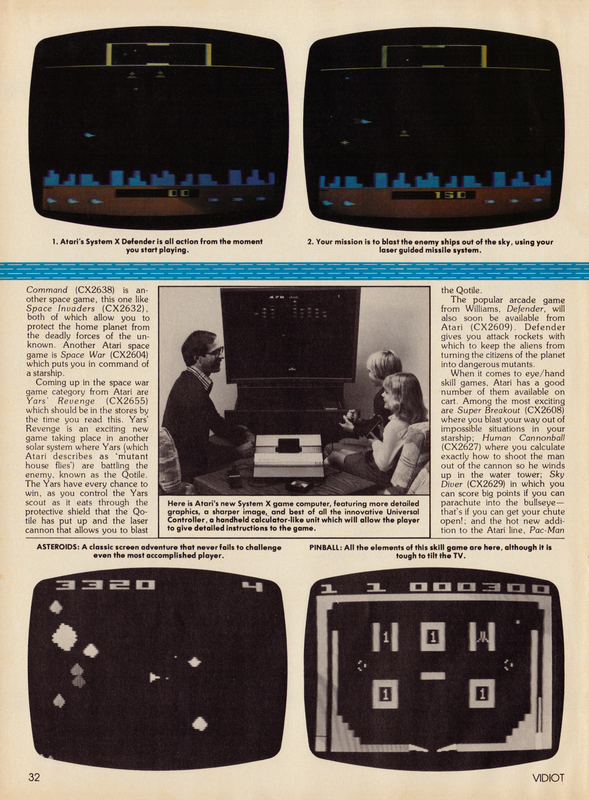 Mattel’s Intellivision appeals to the game player who knows that eye/ hand games are only one facet of the vast player-computer potential. Intellivision’s Master Component with Astrosmash cart in-place is the brainy computer that allows you to play at the Itellivision video games on your home screen. There are many game cartridges available for Intellivision. Space game fans will enjoy Space Battle with its terrific graphic effects. 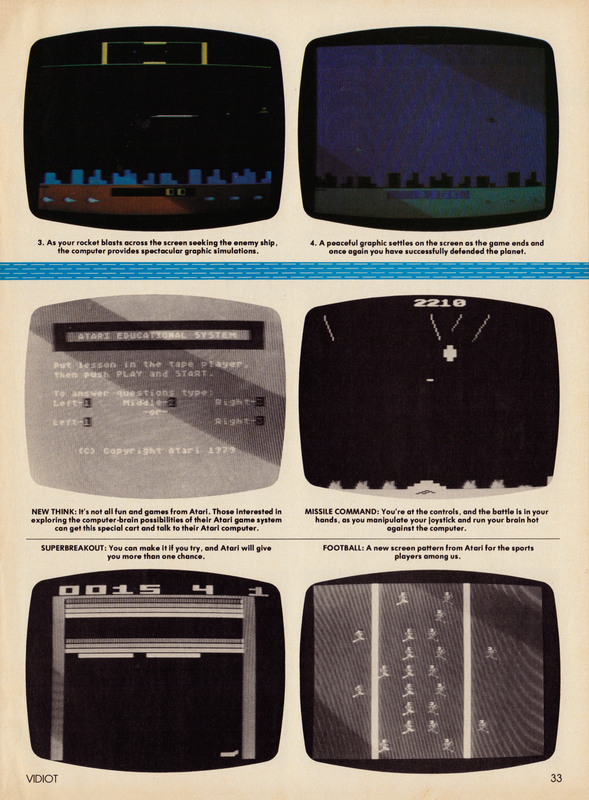 Sports games fans hit a home run with the many game programs from Intellivision. There are NFL Football, NHL Hockey, NBA Basketball, PGA Golf, U.S. Ski Team Skiing, and Major League Baseball. The baseball game is especially fun, since it harks back to the other wonderful mechanical ball games found in arcades, mainly because of the faithfulness of its graphic display to an actual playing field. Add the computer electronics and the result will take you past the seventh inning stretch as you try to keep your no-hitter going. Brain game fans will find games where lady luck steps in, such as Las Vegas Roulette or Las Vegas Blackjack And Poker; as well as games like ABPA Backgammon and Checkers to outwit. Action combat fans will be interested in the two Intellivision cartridges that create battle conditions: Tank Battle and Sea Battle. Intellivision’s superior graphics really excel themselves when the Intellivision Keyboard Component is added to the system. Programs available will teach you French, keep you in shape, and help you manage your investments. There is even a Guitar Lessons program if you’re musically inclined. 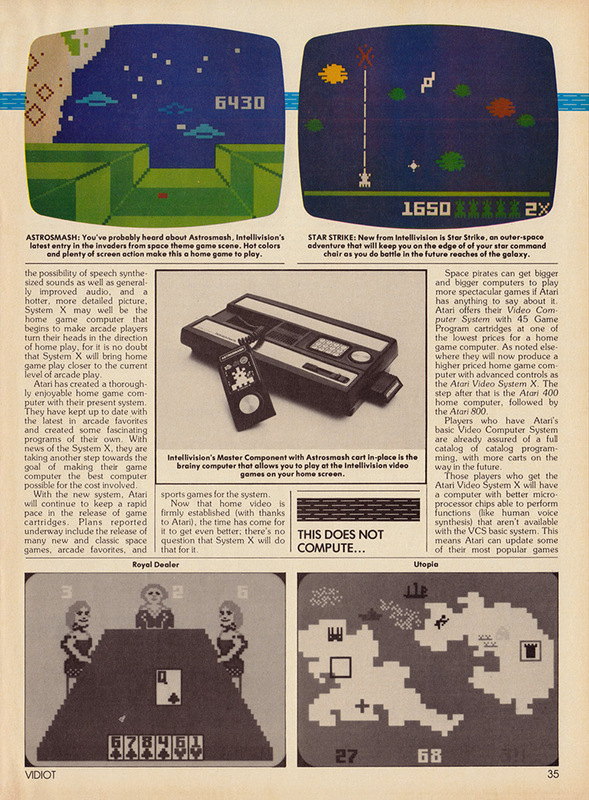 The ability to expand the Intellivision game component into a home computer system poses the problem of when a video game becomes a home computer, and reminds us that even home computers have their happy side, where they can provide more entertainment than helping you figure out which bills you can’t pay. Intellivision demonstrates the truth of this from the game computer viewpoint allowing the player to turn him or herself into a programmer, with the addition of a second component to the system. Plans call for a lot of new action carts, such as Night Stalker, Tron, and Space Hawks, to be released, hopefully by the time you read this. In all, 12 new carts will be introduced for the Intellivision system—dozen more reasons to be a game player. 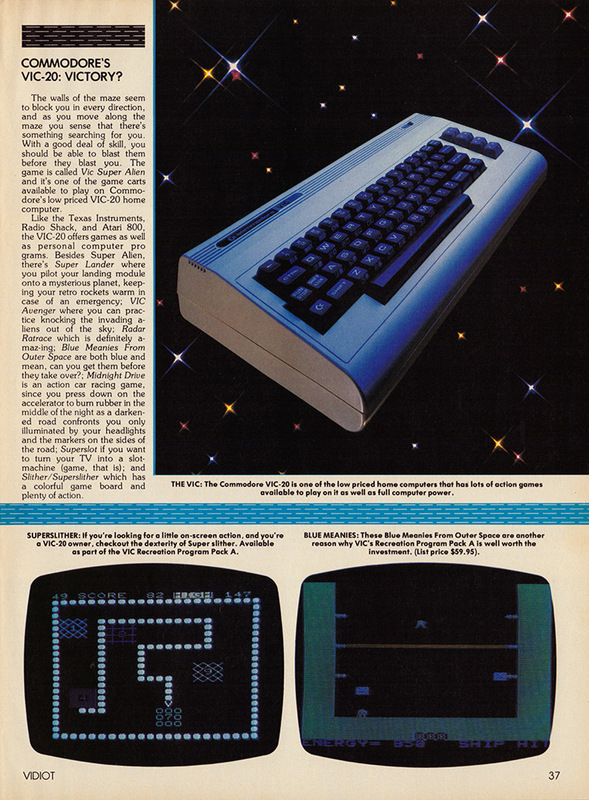 The new action games include Night Stalker where the player is caught in a maze with some mad manic robots; Space Hawks puts the player in his starship, trying not to use up his protective shields as he deals with the realities of space travel; and Advanced Dungeons and Dragons leaves you in a computer controlled labyrinth with a big dragon. Texas Instruments’ TI-99/41 Home Computer is a superb home computer offering several sophisticated games that rival today’s best. 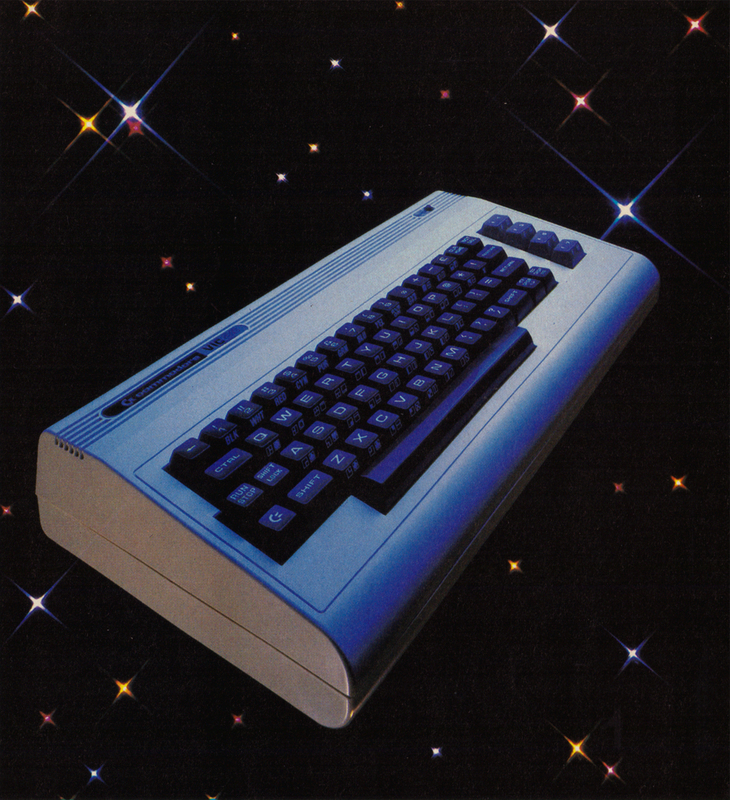 Retailing approximately for the cost of the standard Radio Shack or Apple 400 home computer models, the TI can be modified with further accessories such as the Solid State Speech Synthesizer—which actually allows the machine itself to talk! Possible games include Mind Challenger, A-Mazing, Hunt The Wumpus and Milton Bradley's Attack, Zero Zap and several others. 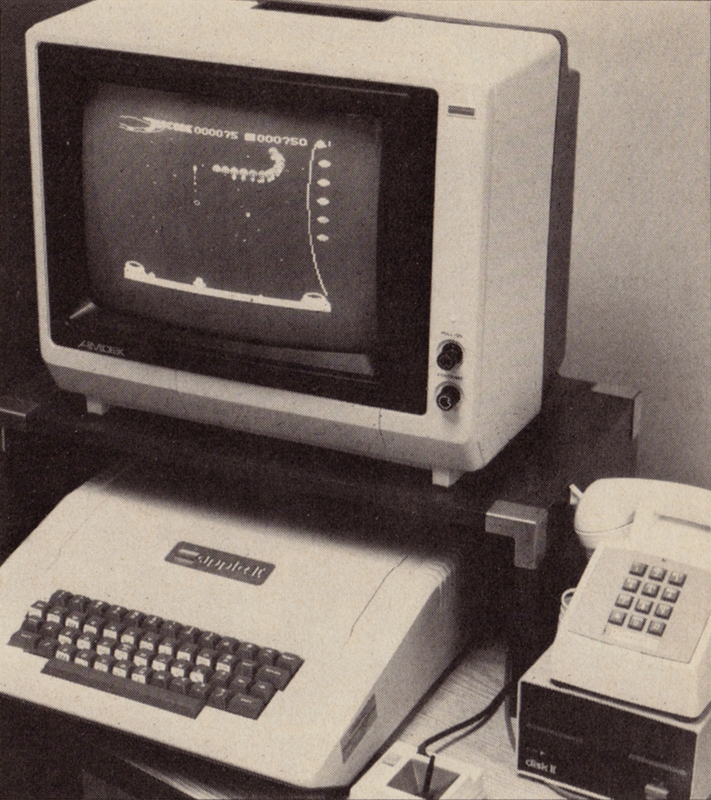 The Texas Instruments Home Computer, like the Apple and Radio Shack computers, is designed to be a home computer as well as a sophisticated game machine. Priced in the same category as the basic Radio Shack and Apple 400 computers, the Texas Instruments’ TI-99/4A Home Computer gets you started with a keyboard and memory, but like other basic units, peripherals and accessories before the basic computer expands to its full usefulness as a home computer system. Fortunately for the games players, most of these accessories aren’t needed to play the games available. Texas Instruments has a number of games programs including Mind Challenger, A-Mazing, and Hunt The Wumpus. In addition, Milton Bradley has created a number of program carts for the TI computer. These include Attack, Blasto, Hustle, Zero Zap, and Yahpzee. One particularly interesting accessory for the Tl computer is the Solid State Speech Synthesizer. This allows the computer to talk as well as produce graphic information. The programmer will find this an exciting addition to the capabilities of the computer with a great deal of potential in creating new games. Among the new game programs that Texas Instruments is offering are a high-speed car race game called Car Wars that sounds definitely out of the ordinary as far as drive-a-car games are concerned. It could lure some players into an area they haven’t worked before; Invaders Command Module which will give plenty of home eye/hand action as you are in charge of the guns that will save the planet from an alien space invasion; Tombstone City takes you to a ghost town in the old west and the frightening prospect of having to protect yourself from Morgs, little green things that seem to be everywhere. A fitting theme for these Texan microchip wizards. Since the Texas Instruments home computer system has many non-game uses as a powerful personal computer, it is good to see that the company continues to develop new game carts for use with the system. The Apple Computer is a relatively expensive home computer that interfaces with numerous accessories to do just about anything you’d want a computer to do. Because it is a “real” computer, albeit a home computer, it has an incredible potential as a games machine. Fortunately the people at Apple are well aware of this and can knock your socks off with the kind of games the Apple will play. The Apple Computer is a relatively expensive “real” computer with an enormous potential as a game machine. In addition to Apple’s own game programs, there are over a dozen video firms offering game programs for the unit, including some of the most sophisticated ones ever invented. In all, there are an estimated 40 or more game programs that can be used on the Apple Computer. In addition, the computer has many usesd besides game play, making it an extremely valuable computer unit. As a “real” home computer, the Apple points up the incredible potential of games with in-depth programs. Altogether over a dozen different software firms offer games programs that can be played on the Apple. This is in addition to Apple themselves who have such programs as Apple Stellar Invaders to whet your appetite for the unknown. With your Apple system you have the choice of some of the _most sophisticated (and incredible) games programs ever in vented by the mind of man and machine. 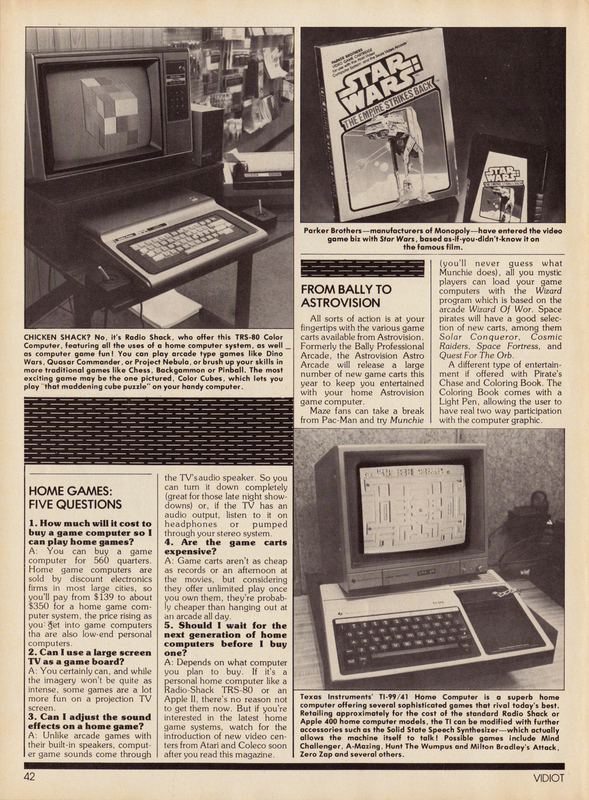 There’s Automated Simulations’ programs which include Temple of Apshai and Hellfire Warrior; Avalon Hill Game Co.’s Major League Baseball) Cavalier Computer’s Star Thief; Muse’s Robot War and Three Mile Island; On Line Systems’ Mystery House, Gobbler, and Pegasus II and Sirius Software’s Gorgon, Epoch, and Space Eggs. In all, there are an estimated 40 or so game programs that can be used with the Apple Computer. Of course the Apple Computer has more practical uses than game play, and there are all sorts of programs for business and home-organization applications. So if you’re more interested in checking your inventory than repelling space invaders, the Apple is just as valuable. As a real home computer, the Apple points up the incredible potential of games with in-depth programs. The results are some of the most devious, clever, entertaining, amusing, and astounding game programs yet written. While some may be a little subtle for eye/ hand hot shots, others can create multi-dimension graphics that you just won’t find in current arcade games. THE VIC: The Commodore VIC-20 is one of the low priced home computers that has lots of action games available to play on it as well as full computer power. The walls of the maze seem to block you in every direction, and as you move along the maze you sense that there’s something searching for you. With a good deal of skill, you should be able to blast them before they blast you. The game is called Vic Super Alien and it’s one of the game carts available to play on Commodore’s low priced VIC-20 home computer. Like the Texas Instruments, Radio Shack, and Atari 800, the VIC-20 offers games as well as personal computer programs. Besides Super Alien, there’s Super Lander where you pilot your landing module onto a mysterious planet, keeping your retro rockets warm in case of an emergency; VIC Avenger where you can practice knocking the invading aliens out of the sky; Radar Ratrace which is definitely amazing; Blue Meanies From Outer Space are both blue and mean, can you get them before they take over? ; Midnight Drive is an action car racing game, since you press down on the accelerator to burn rubber in the middle of the night as a darkened road confronts you only illuminated by your headlights and the markers on the sides of the road; Superslot if you want to turn your TV into a slot-machine (game, that is); and Slither/Superslither which has a colorful game board and plenty of action. An imaginary conversation with your computer? Your computer talks back? All possible, since voice synthesizer electronics have been available for some time. Until very recently, game programmers haven’t spent as much time as they might on the audio portion of the program. Some, perhaps rightly, consider the audio as secondary; others have limited memory and don’t want to waste program space on sound when that same space might be used to improve picture resolution or game strategy. But for Intellivision users, all that has changed. 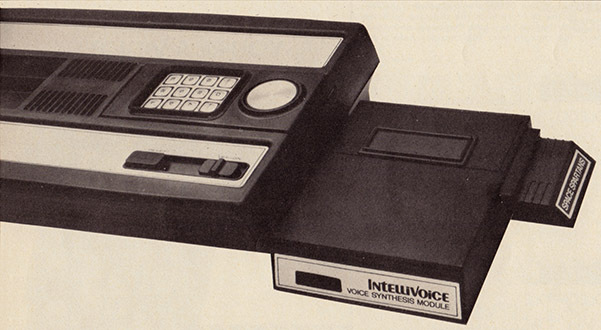 Mattel Electronics has a new Intellivoice Voice Synthesizer. This module is plugged into the Intellivision Master Component to give the computer the power of speech. What’s exciting about this are the new special carts that will be introduced to take advantage of the speech synthesizer. So far, it’s reported that Space Spartans, Bomber Squad, and B-17 Bombers are to be offered. All these programs will talk in realistic computer male and female tones. And, if you’re lucky they’ll warn you of the danger lurking inside the next black hole. 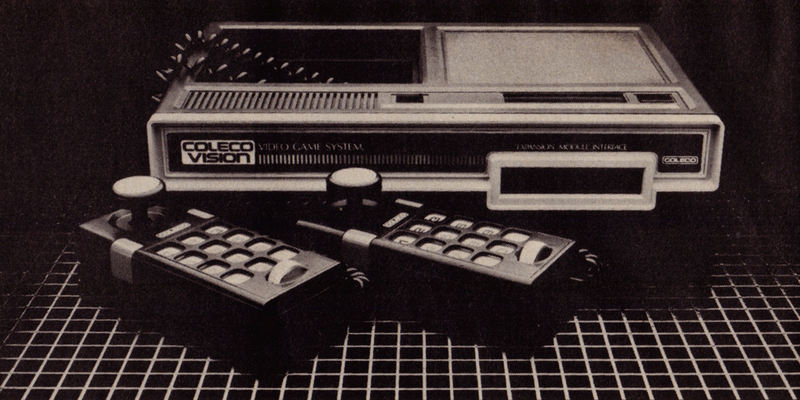 Coleco Industries is known as one of the largest manufacturers of self-contained electronics games, but they’ve put another feather in their cap with the introduction of a line of video cartridges they’ve developed. These carts are for use with the Atari Video Computer System and the Mattel Electronics’ Intellivision. Donkey Kong: Nintendo’s trademarked Donkey Kong features the climbing of a steel fortress while dodging objects hurled from the top of the building. Plenty of action here. Venture: Get through the chambers to the room with the Ire sure, easy if you can avoid the beast that protects the treasure. 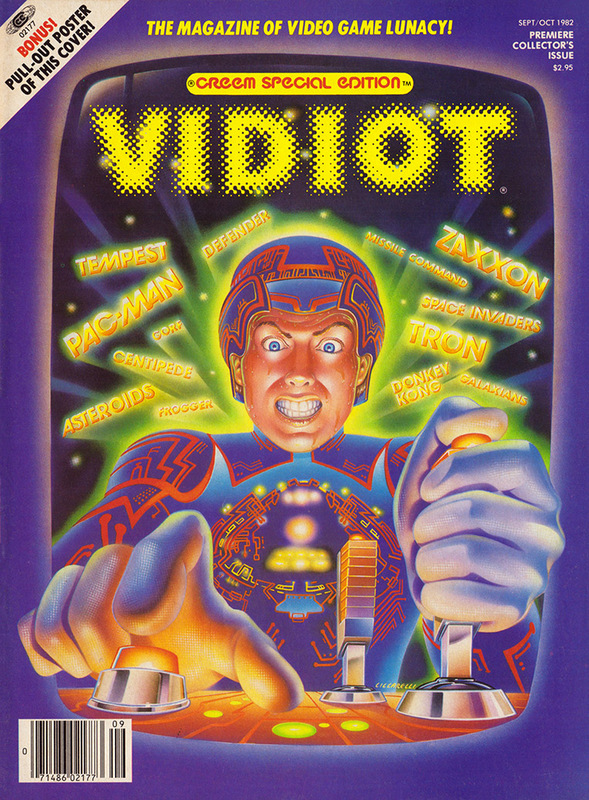 Exidy’s trademarked Venture game rewards the player for both skill and daring. Cosmic Avenger: Your starship has hit alien territory and you must engage in an air and sea battle over the ocean and enemy city. Firing as you go, you’ll be a fleet commander after a few plays of Universal’s Cosmic Avenger. Mouse Trap & Lady Bug: Universal’s trademarked Lady Bug and Exidy’s Mouse Trap are both maze-oriented adventures. Mouse Trap has the play mouse eating bits of cheese as the hungry cat chases him through a maze of hallways. Look for the secret tunnel. Lady Bug eats dots as she goes through the maze, but she’s got to be careful, some of the dots are poisonous and there are also evil bugs lurking in the maze. Zaxxon: Sega/Gremlin’s trademarked space battle game pits the player against enemy forcefields and provides a lot of starship action play. Turbo & Rip Cord: (Sega/Gremlin, Exidy trademark respectively) are two other action games. Turbo is a race car game with a drive through city streets, through tunnels and over bridges onto winding country roads. Rip Cord lets you parachute out of a plane and try to land in the safety zone as you float through a sky filled with helicopter gunships. STATE OF THE ART: It’s called ColecoVision and it’s described as “third generation state of the art video game.” The creator, Coleco Industries, Inc., is introducing the machine as a true home computer game center. Among the machine’s many innocations is what Coleco calls its “roller controller.” This controller gives players the ability to change action speed during play. 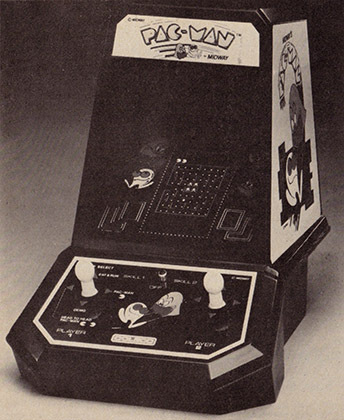 There is an eight direction joystick, a twelve button keyboard and two fire/action buttons. A great addition to ColecoVision is their Conversion Module #1 which Coleco says, “…allows ColecoVision owners to use the entire line of Atari Video Computer System Cartridges with the Coleco system.” There is a second module, set to be released next year, that will turn the ColecoVision system into a personal computer. 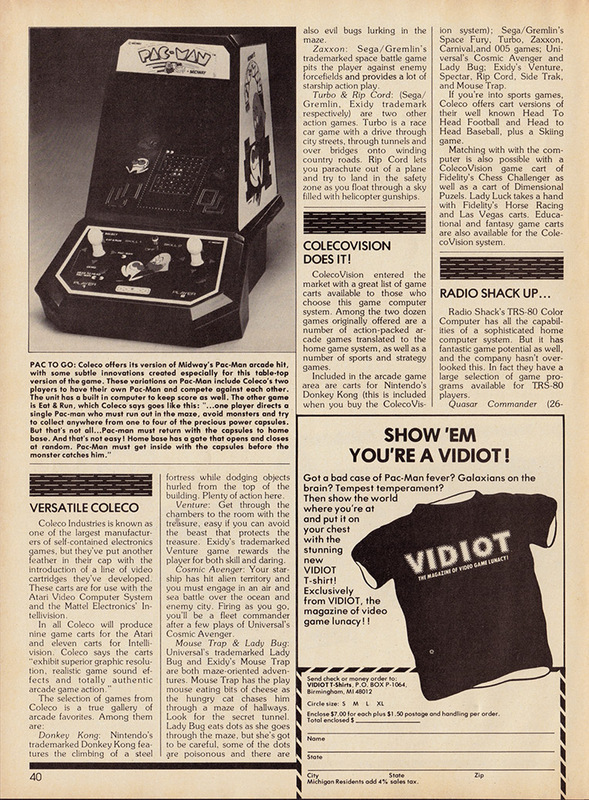 ColecoVision entered the market with a great list of game carts available to those who choose this game computer system. Among the two dozen games originally offered are a number of action-packed arcade games translated to the home game system, as well as a number of sports and strategy games. Included in the arcade game area are carts for Nintendo’s Donkey Kong (this is included when you buy the ColecoVision system); Sega/Gremlin’s Space Fury, Turbo, Zaxxon, Carnival, and 005 games; Universal’s Cosmic Avenger and Lady Bug; Exidy’s Venture, Spectar, Rip Cord, Side Trak, and Mouse Trap. If you’re into sports games, Coleco offers cart versions of their well known Head To Head Football and Head to Head Baseball, plus a Skiing game. Matching with with the computer is also possible with a ColecoVision game cart of Fidelity’s Chess Challenger as well as a cart of Dimensional Puzels. Lady Luck takes a hand with Fidelity’s Horse Racing and Las Vegas carts. Educational and fantasy game carts are also available for the ColecoVision system. CHICKEN SHACK? No, it’s Radio Shack, who offer this TRS-80 Color Computer, featuring all the uses of a home computer system, as well as computer game fun! You can play arcade type games like Dino Wars, Quasar Commander, or Project Nebula, or brush up on your skills in more traditional games like Chess, Backgammon or Pinball. The most exciting game may be the one pictured, Color Cubes, which lets you play “that maddening cube puzzle” on your handy computer. Radio Shack’s TRS-80 Color Computer has all the capabilities of a sophisticated home computer system. But it has fantastic game potential as well, and the company hasn’t overlooked this. In fact they have a large selection of game programs available for TRS-80 players. Quasar Commander (26-3051) presents full color action as you command your starship to destroy alien ships. If you want, you can set the autopilot and the onboard computer will fight the enemy for you. Dino Wars (26-3057) will please Space Invaders fans. Besides eliminating alien invaders, you’ll be aided by other defenders for one last stand against the aliens. Other arcade type action games include Project Nebula (26-3063) and Polaris (26-3065), both of which let the player test his eye/hand coordination against the dangers of the enemy. More conventional games fans will find a number of programs, including Pinball (26-3052), Chess (26-3050) and Backgammon (26-3059) all with brilliant color graphics. 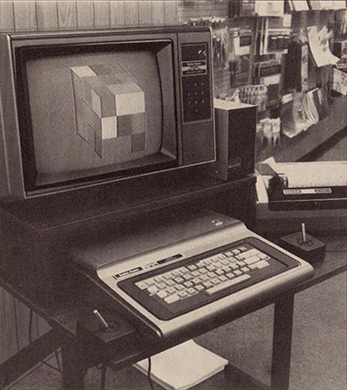 3-D players will be challenged by Color Cubes (26-3075) which Radio Shack describes as letting you play “…that maddening cube puzzle on your computer.” The game program gives you 255 moves in its memory storage and the computer will retrace your moves as you try to figure out how you got there. In more computer oriented programs, the company offers a number of interesting program packs. There’s Art Gallery (26-3061) that lets you draw and store art on your TV screen and you hear the tones; and the Audio Spectrum Analyzer (26-3156), which despite its tech title allows your computer to generate color visuals from your hi-fi system. Look familiar? That’s right, it’s Pac-Man and his friendly enemy, whom Atari informs us is named Blinkey. They left their machines, grew legs and sneakers, and went for a walk to let folks know that when it’s spring Pac-Mn Day is on the way. No, it isn’t an official national holiday yet. 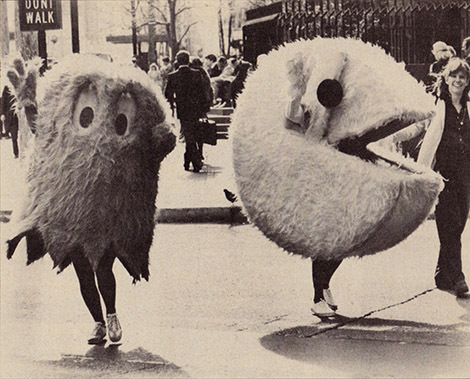 Schools are still open, the mail is delivered…but Pac-Man Day is still a new tradition in special events. 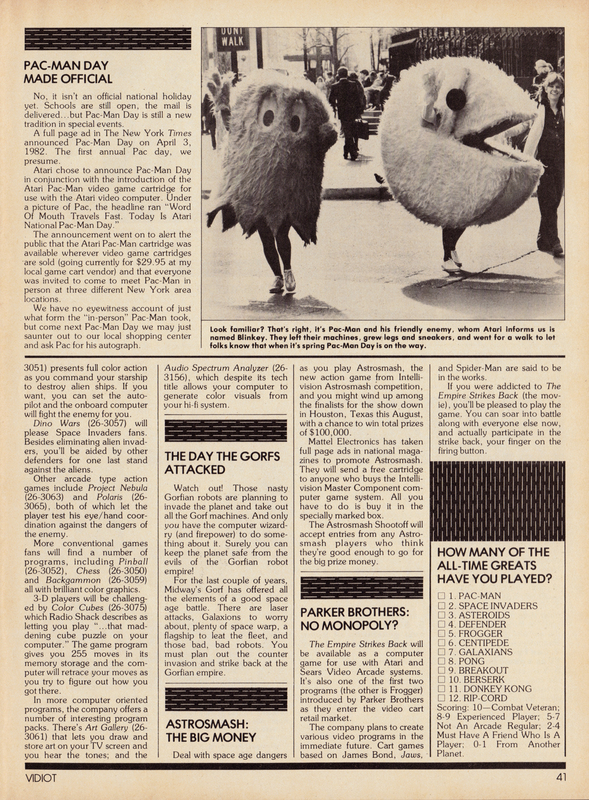 A full page ad in The New York Times announced Pac-Man Day on April 3, 1982. The first annual Pac day, we presume. 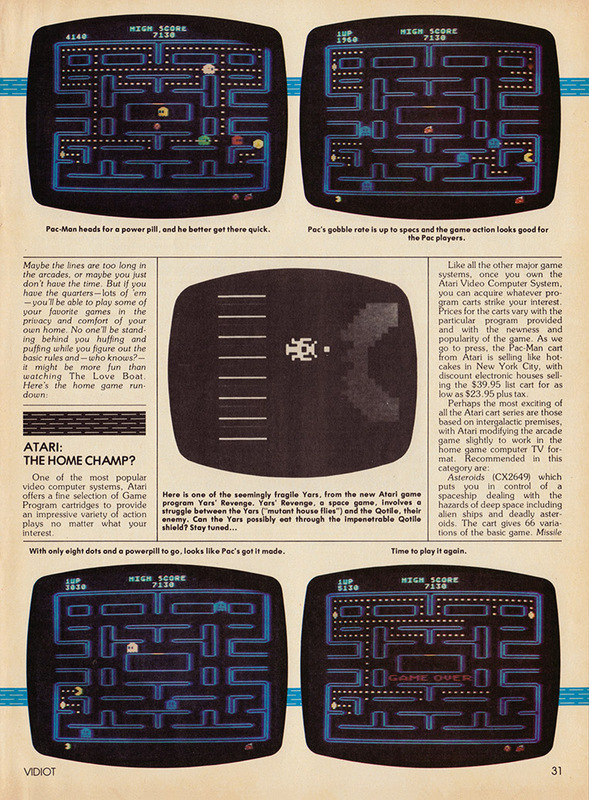 The announcement went on to alert the public that the Atari Pac-Man cartridge was available wherever video game cartridges ·are sold (going currently for $29. 95 at my local game cart vendor) and that everyone was invited to come to meet Pac-Man in person at three different New York area locations. 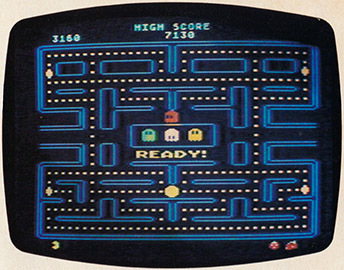 We have no eyewitness account of just what form the “in-person” Pac-Man took, but come next Pac-Man Day we may just saunter out to our local shopping center and ask Pac for his autograph. Watch out! Those nasty Gorfian robots are planning to invade the planet and take out all the Gorf machines. And only you have the computer wizardry (and firepower) to do something about it. Surely you can keep the planet safe from the evils of the Gorfian robot empire! For the last couple of years, Midway’s Gorf has offered all the elements of a good space age battle. There are laser attacks, Galaxions to worry about, plenty of space warp, a flagship to leat the fleet, and those bad, bad robots. You must plan out the counter invasion and strike back at the Gorfian empire. ASTROSMASH: You’ve probably heard about Astrosmash, Intellivision’s latest entry in the invaders from space theme game scene. Hot colors and plenty of screen action make this a home game to play. Deal with space age dangers as you play Astrosmash, the new action game from Intellivision Astrosmash competition, and you might wind up among the finalists for the show down in Houston, Texas this August, with a chance to win total prizes of $100,000. 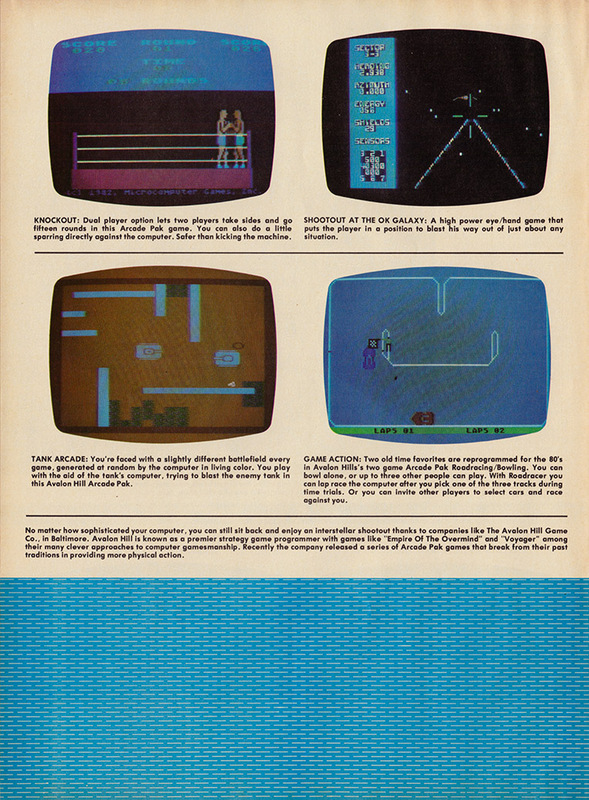 Mattel Electronics has taken full page ads in national magazines to promote Astrosmash. They will send a free cartridge to anyone who buys the Intellivision Master Component computer game system. All you have to do is buy it in the specially marked box. The Astrosmash Shootoff will accept entries from any Astrosmash players who think they’re good enough to go for the big prize money. Parker Brothers—manufacturers of Monopoly—have entered the video game biz with Star Wars, based as-if-you-didn’t-know it on the famous film. 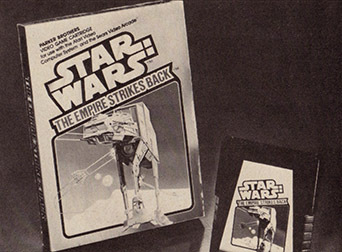 The Empire Strikes Back will be available as a computer game for use with Atari and Sears Video Arcade systems. It’s also one of the first two programs (the other is Frogger) introduced by Parker Brothers as they enter the video cart retail market. The company plans to create various video programs in the immediate future. Cart games based on James Bond, Jaws, and Spider-Man are said to be in the works. If you were addicted to The Empire Strikes Back (the movie), you’ll be pleased to play the game. You can soar into battle along with everyone else now, and actually participate in the strike back, your finger on the firing button. How Many of the All-Time Greats Have You Played? Scoring: 10- Combat Veteran; 8-9 Experienced Player; 5-7 Not An Arcade Regular; 2-4 Must Have A Friend Who Is A Player; 0-1 From Another Planet. 1. How much will it cost to buy a game computer so I can play home games? A: You can buy a game computer for 560 quarters. Home game computers are sold by discount electronics firms in most large cities, so you’ll pay from $139 to about $350 for a home game computer system, the price rising as you: get into game computers tha are also low-end personal computers. 2. Can I use a large screen TV as a game board? A: You certainly can, and while the imagery won’t be quite as intense, some games are a lot more fun on a projection TV screen. 3. Can I adjust the sound effects on a home game? 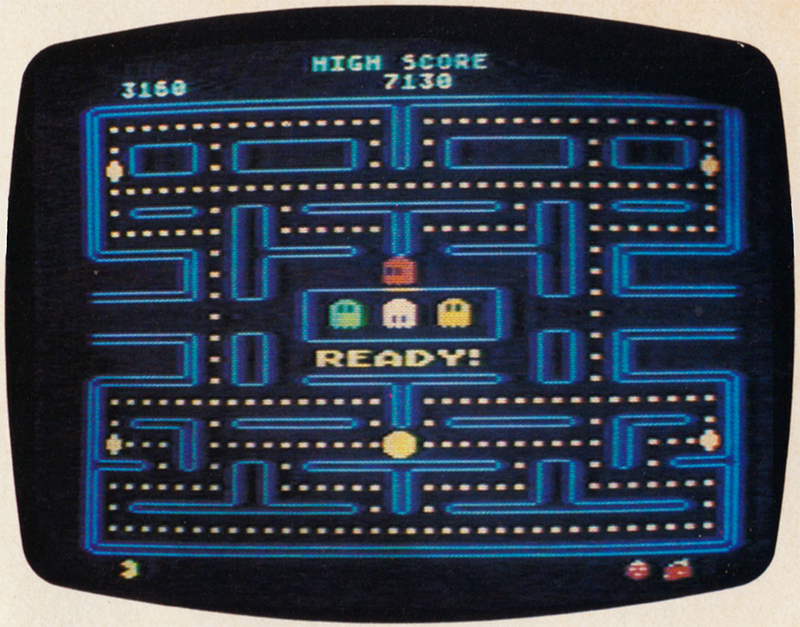 A: Unlike arcade games with their built-in speakers, computer game sounds come through the TV’s audio speaker. So you can turn it down completely (great for those late night showdowns) or, if the TV has an audio output, listen to it on headphones or pumped through your stereo system. 4. Are the game carts expensive? A: Game carts aren’t as cheap as records or an afternoon at the movies, but considering they offer unlimited play once you own them, they’re probably cheaper than hanging out at an arcade all day. 5. Should I wait for the next generation of home computers before I buy one? A: Depends on what computer you plan to buy. If it’s a personal home computer like a Radio Shack TRS-80 or an Apple II, there’s no reason not to get them now. 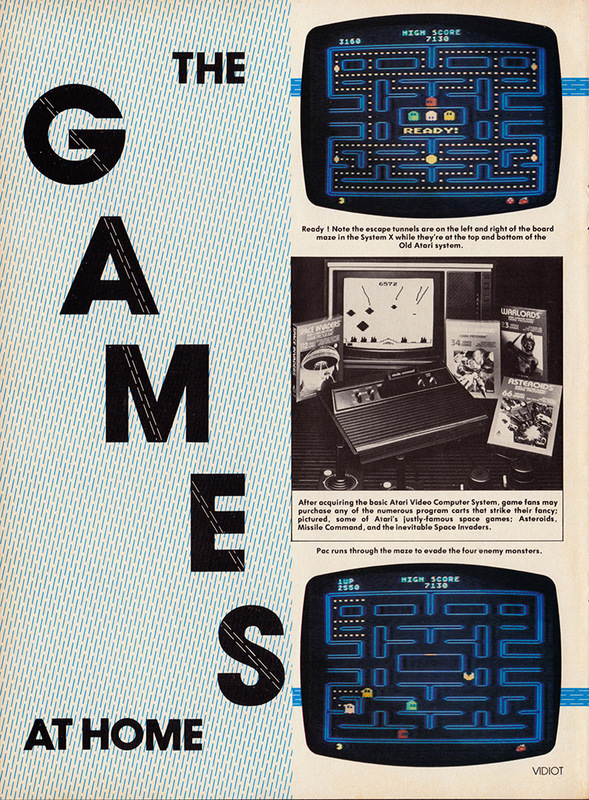 But if you’re interested in the latest home game systems, watch for the introduction of new video centers from Atari and Coleco soon after you read this magazine. All sorts of action is at your fingertips with the various game carts available from Astrovision. Formerly the Bally Professional Arcade, the Astrovision Astro Arcade will release a large number of new game carts this year to keep you entertained with your home Astrovision game computer. Maze fans can take a break from Pac-Man and try Munchie (you’ll never guess what Munchie does), all you mystic players can load your game computers with the Wizard program which is based on the arcade Wizard Of Wor. Space pirates will have a good selection of new carts, among them Solar Conqueror, Cosmic Raiders, Space Fortress, and Quest For The Orb. A different type of entertainment if offered with Pirate’s Chase and Coloring Book. The Coloring Book comes with a Light Pen, allowing the user to have real two way participation with the computer graphic.